For two years, World Resources Institute’s Better Buying Lab has taken an in-depth look at what works and what doesn’t when it comes to describing plant-rich foods in a way that appeals to broad swaths of the United States and British populations. Our early findings identify four kinds of language to avoid and three to embrace to help restaurants and the food industry boost sales of plant-rich menu items. If you lived in ancient Greece and ate a diet without meat, you very likely called yourself a Pythagorean. That's because this way of eating was closely associated with the Greek philosopher and mathematician Pythagoras (of Pythagorean Theorem fame) and remained so in many parts of the world until the mid-1800s, when the diet took on a name familiar today: vegetarian. Although plant-based diets historically were the norm in many cultures, in industrial societies, meat has gone from an occasional treat to weekly or even daily fare. In these societies, vegetarianism is a hard sell. Latest U.S. data show just 5 percent of Americans identify as vegetarian. In Britain, 7 percent of the population say they eat a diet without meat or any animal products. These low numbers are unsurprising, according to Paul Rozin of the University of Pennsylvania: "Meat is one of people's most favored foods. In terms of taste, it ranks at or near the top of human foods, and is often the center of the main meal." Today, agriculture uses almost half of the world’s vegetated land, and agriculture and related land-use change are responsible for generating one-quarter of annual global greenhouse gas (GHG) emissions. Different types of food have different impacts on the environment. 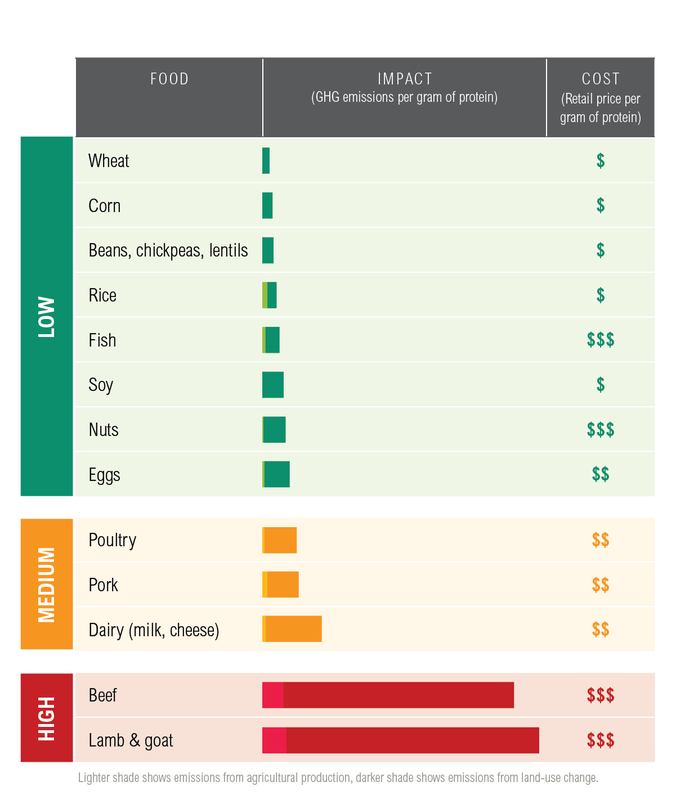 Looking at the chart below, we see how much greater the impact of producing ruminant meats (beef, lamb and goat) is compared to other foods. If global consumers shifted 30 percent of their expected consumption of ruminant meat in 2050 to plant-based proteins, the change in diets would close half of agriculture’s GHG mitigation gap to hold global warming well below 2 degrees Celsius – even as the population climbs toward 10 billion by mid-century. But in an era of dangerous climate change, the connection between rising global temperatures and consumption of resource-intensive foods like beef and other meats has become clear. People in places where meat is considered a staple need to shift toward diets centered on plant-rich foods, which we define as consisting primarily of vegetables, legumes, fruits, grains, pulses, nuts and seeds. These foods may also include animal-based products like eggs and dairy, but not meat or fish. In addition to benefiting the climate, a plant-rich diet comes with important health benefits. Here's the challenge: how can we make the plant-rich diet the mainstream diet? One strategy with radical potential borrows a page from the past: change the language we use to describe plant-rich foods. For two years, World Resources Institute's (WRI) Better Buying Lab has taken an in-depth look at what works and what doesn't when it comes to describing plant-rich foods in a way that appeals to broad swaths of the United States and British populations. Our early findings identify four kinds of language to avoid and three to embrace to help restaurants and the food industry accelerate the shift. 12:30 p.m. is when lunchtime sales peak at the Sainsbury's supermarket café in the seaside town of Truro, England. Construction workers, mothers and retirees stop by to pick up a hot meal, and "sausage and mash" is a best-selling traditional comfort food – and one that Sainsbury's was eager to put to the test. For several years now, the UK's second largest retailer has offered its café customers "Meat-Free Sausage and Mash" in a bid to provide more variety. From August to October 2017, the company tested alternative names to see if sales would change. They did. 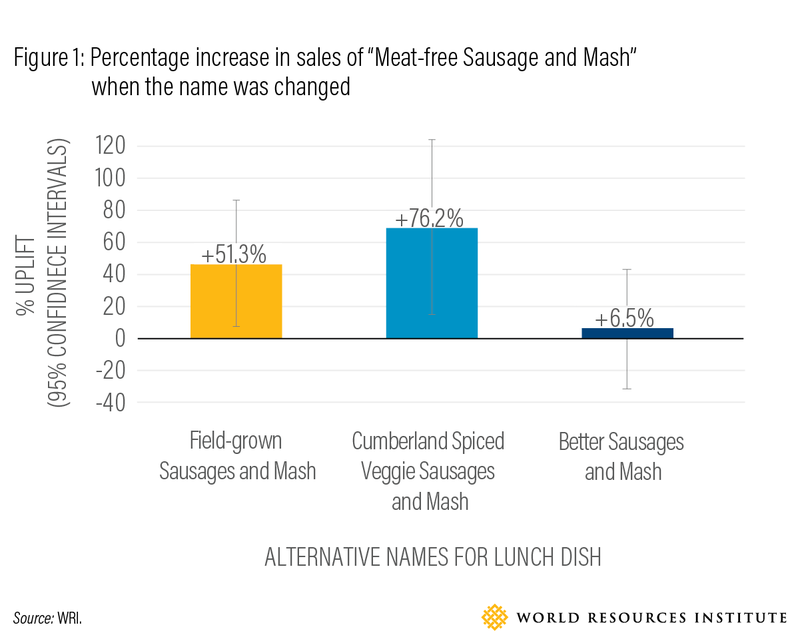 "Cumberland-Spiced Veggie Sausage & Mash" performed the best, increasing sales an astounding 76 percent (Figure 1). "This trial has provided some fascinating insights into what can impact a customer's choice when choosing a vegetarian dish and just how impactful language can be on that final decision. We will now apply the insights from this study across our wider range of Sainsbury's Own Brand food items to help broaden the appeal of our plant-based products and encourage customers to follow a more sustainable diet as a result," said Claire Hughes, Head of Quality and Innovation at Sainsbury's. The Sainsbury's test is backed by results from online trials undertaken by the Better Buying Lab. Across the board, so-called "meat free" dishes have performed poorly, with virtually every alternative name doing better. That's probably because emphasizing what is missing from a dish triggers people's desire to avoid losing out on something. It's counterproductive to communicate that a food is "free" of meat if the goal is to appeal to more meat-eaters. Leading with information about what something will not be like also limits the brain's ability to positively imagine how it might taste. "Vegan" means "different from me"
"How can you tell if someone is vegan? Don't worry, they'll tell you soon enough." So goes the joke and within it, the idea that vegans are often evangelical about their dietary choices and non-vegans are wary of hearing it. While only a joke, it is reflective of the current discourse. In a study of British newspapers in 2011, 74 percent of 397 articles containing the word "vegan" portrayed the diet, which includes no animal products, as difficult or impossible to maintain and often associated it with terms like restrictive, faddists, hippie and weak. Not much has changed in the years since. In 2017, the Better Buying Lab commissioned Brandwatch, a leading social media analytics company, to scan 15.4 million posts across Twitter, Instagram, blogs and forums from Britain and the United States that included references to plant-based, vegan and vegetarian food. The term "vegan" was more than twice as likely to be used in negative contexts as "plant-based." 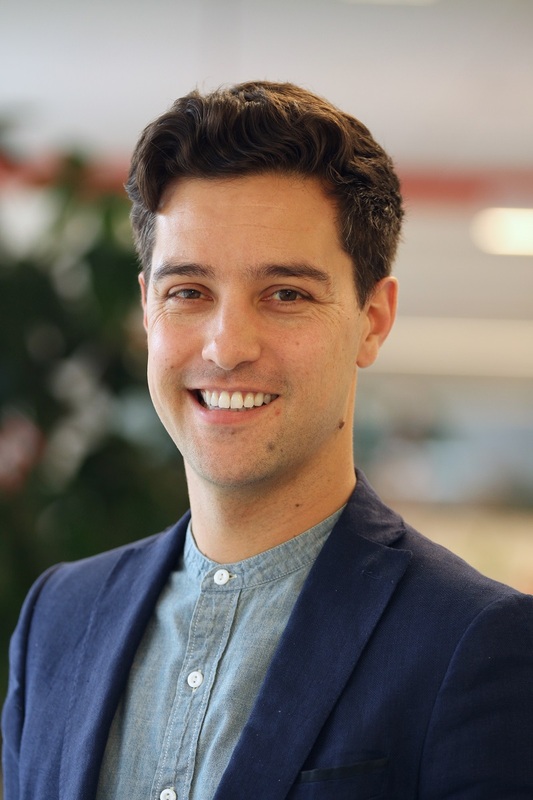 Edward Crook, Global Research vice president at Brandwatch, believes that "vegan" may be alienating consumers. "Our analysis found the vegan lexicon to be quite divisive online, and it may prevent some people from experimenting with the growing range of plant-based proteins available. To broaden mainstream appeal, new language is needed that avoids an ‘us-them' mentality," he said. The psychology behind this is fascinating. Research has shown that food is part of forming our social identity and with it, the creation of an "in group" of like-minded individuals who model and reinforce each other's views and behaviors. Those deemed dissimilar to the "in group" (in this case, the meat-eating majority) are seen as part of an "out group," with less favorable values and behaviors. Vegans are this "out group." For example, one U.S. undergraduate honors thesis on the "vegan-omnivore conflict" vividly describes the hostility that vegans sometimes encounter from meat eaters." It's no surprise then that using the label "vegan" doesn't help drive sales. One study in the United States asked consumers to rank the relative appeal of 21 different labels used to describe food and beverages, with the vegan label emerging as the least appealing of all the options – 35 percent of consumers said it would make them less likely to buy a product. While valiant attempts are being made to rebrand vegan with an emphasis on the younger generation, the baggage held by mainstream audiences is formidable. So while we recommend that "vegan" is not used to describe plant-based dishes, we do advise using a symbol, such as a leaf, on menus or packaging to indicate a dish is suitable for vegans. We also recommend checking with local or national regulations for any country-specific denotation. 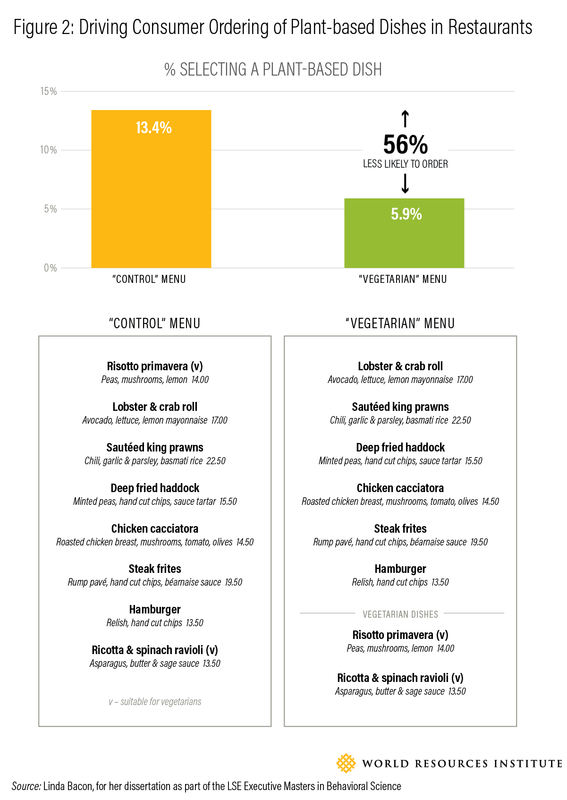 "Vegetarian" means "healthy – but unsatisfying – food"
You're looking at the menu in a restaurant. Do you order something from the main list or something from the vegetarian section? If you're a meat eater, you are 56 percent less likely to order a plant-rich dish if it's contained within a "vegetarian" box. That's the finding from a 2016 study by the London School of Economics (LSE) and advised by the Better Buying Lab. Why? While vegetarianism is perceived with less negativity than veganism, it has both positive and negative associations. On the bright side, the general population perceives a vegetarian diet as healthy, with most agreeing that it offers less saturated fat. People also associate a sense of well-being, and peace or contentment with a vegetarian diet. However, diners say they are concerned about a perceived lack of protein and/or iron and that a vegetarian diet may be nutritionally unbalanced. Vegetarian diets are also seen by many as boring and bland, and meat-free diets not tasty enough. This last point is especially important since research shows that taste is a primary driver of consumer decisions on what food to buy. And then there are stereotypes about people who identify as vegetarian. Compared to vegans, vegetarians tend to benefit more from being seen as virtuous, thoughtful and animal lovers. But they are also characterized as weak, and omnivores often do not want themselves to be negatively stereotyped as such. Many men also worry that a vegetarian diet would make them appear less masculine, though a recent U.S. study suggested that vegetarian men are no longer perceived in this way. That dubious honor is now given to men who choose to be vegan. When it comes to naming food, "vegetarian" can evoke a complex mix of positive and negative perceptions amongst meat-eaters, which as the LSE menu study showed can reduce ordering. It is still unclear, however, whether terms like "veggie" and "vegetable" should be excluded, so this represents fresh ground for more research. We do, however, advise using a symbol to indicate a dish is suitable for vegetarians and recommend checking with local regulations for any country-specific denotation. To arrive at our final type of language to avoid, we start at a party in America. At the party, guests were given the same mango lassi: a cold mango-yogurt drink popular in India but unfamiliar to those at the party. For half the guests, the mango lassi was labelled as "healthy." For the others, the mango lassi was labelled as "unhealthy." After the party, those who had the "healthy" drink rated their lassi as 55 percent less enjoyable than those who drank the "unhealthy" version. Other tests looking at cookies, milkshakes and even soup have shown similar findings. Why? People just don't see healthy foods as all that enjoyable. "Healthy doesn't sell," says Erica Holland-Toll, executive chef of Stanford University's Flavor Lab. "People don't want to eat dishes that are marketed as good for them. If you have a delicious roasted zucchini with mint and feta cheese, don't talk about how good the zucchini is for you." Holland-Toll was part of a groundbreaking study that Better Buying Lab member Stanford Residential & Dining Enterprises released last year in partnership with the Stanford Mind & Body Lab, which revealed that people are no fans of labels like "reduced-sodium" and "lighter choice." An underlying intuition is that healthy equals not tasty. But while this may be the case in U.S. and UK markets, it's not conclusive or universal. Studies have also found that in France, for example, healthier items are rated as tastier. Timing is also a factor, as many Americans and Brits will tell you they seek out a healthy lunch on Mondays (maybe they're trying to make up for an overly indulgent weekend?). The point is: like others, you probably want an enjoyable, tasty and filling experience when you eat. If plant-rich foods are already thought of as "boring and bland," highlighting these foods' health benefits can throw "not tasty" into the mix of potential negative perceptions. For this reason, we recommend avoiding healthy-restrictive language. We would like to see more research done to help the food industry understand when and where health-related language can enhance appeal, though. Let's now see if there are ways health can sell. During the lunchtime rush, people visiting the Panera Bread in the North Hills Shopping Center in Los Angeles were ordering more black bean soup than usual. A simple name change that highlighted the origin of the dish made the difference. The North Hills branch of the 2,000-strong Panera chain was one of 18 locations in the L.A. area to switch the name of "Low Fat Vegetarian Black Bean Soup" to "Cuban Black Bean Soup" in a month-long naming test in January 2018. This easy swap resulted in a 13 percent uplift in sales of the black bean soup in these locations. Mindy Gomes Casseres, senior manager for Corporate Social Responsibility at Panera Bread, attributes the uptick to highlighting the soup's provenance: "It was an exciting result for us. By showcasing the dish's origin, we were able to make the dish more appealing to guests. The new name conveys a well-seasoned and flavorful taste profile, and we think that's what led to a sales increase." Leveraging a food's provenance is a powerful tactic to create positive associations with a product. Think Chicago-style pizza, Texas BBQ and New England clam chowder. In the U.S., Sodexo has named its new plant-based "crab" cake the "Chesapeake Cake"—a nod to the Chesapeake Bay, an area famous for its fresh crabs. The Better Buying Lab's online research in the United Kingdom found that renaming a "Chickpea and Potato Curry" to "Indian Summer" also resulted in a 15 percent bump in consumers' stated likelihood of ordering the dish. The definition of provenance is "the place of origin or earliest known history of something." For plant-rich foods, provenance can include the natural environment in which it's grown. 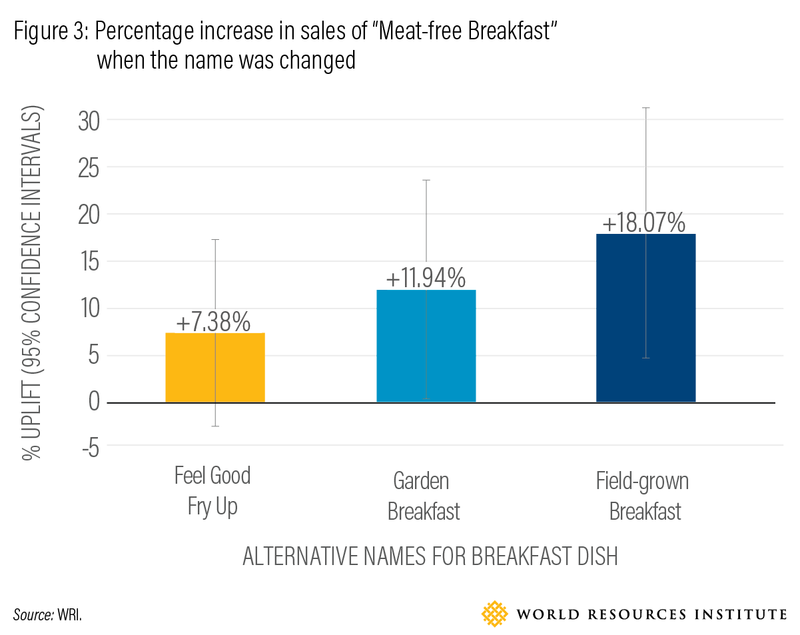 In a test the Better Buying Lab did with Sainsbury's in the UK, changing the name of "Meat-free Breakfast" to "Garden Breakfast" and "Field Grown Breakfast" increased sales by 12 and 17 percent respectively (Figure 3). A number of plant-rich brands, including Field Roast, Garden Gourmet and Sweet Earth, also make good use of highlighting the link between their foods and the natural environment. In an industrial park in Tottenham, North London, they're cooking up a plant-rich revolution. 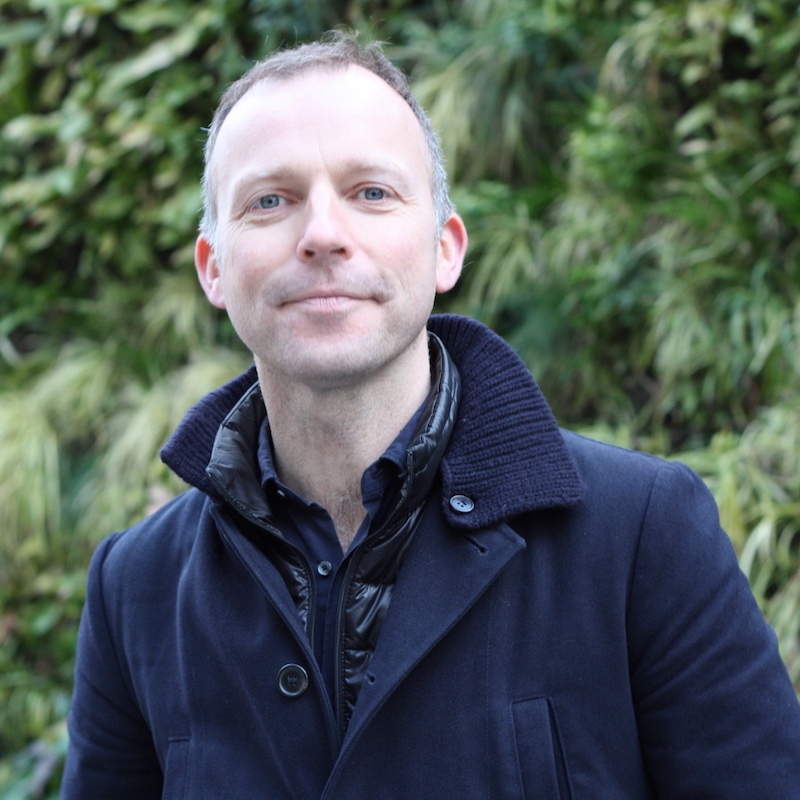 This is home to allplants, the chef-cooked, plant-rich meal delivery service that recently received a £7.5 million ($9.6 million) influx of funding from food, tech and eCommerce giants. Founded by brothers Jonathan and Alex Petrides in 2017, the company has used flavor-based naming to drive growth. As Alex tells it, "When we started out, we were using more ingredient specific names like ‘Black Bean Chili' and ‘Beets Bourguignon,' but we've learned that names highlighting the delicious, distinctive flavors we use, such as ‘Smoky Soul Chili' and ‘Fiery Jerk Jackfruit,' are much more successful." In other words, spotlighting what a dish will taste like can be a route to getting people's mouths watering. Flavorsome ingredients, flavor-enhancing cooking methods or an interesting combination of flavors can all communicate an attractive flavor profile. Many classic meat-based dishes use this well. Think of Moroccan spiced lamb, slow-roasted beef brisket, or sweet-and-sour chicken. A groundbreaking study from Stanford last year confirmed that highlighting flavor increases sales of plant-rich dishes. 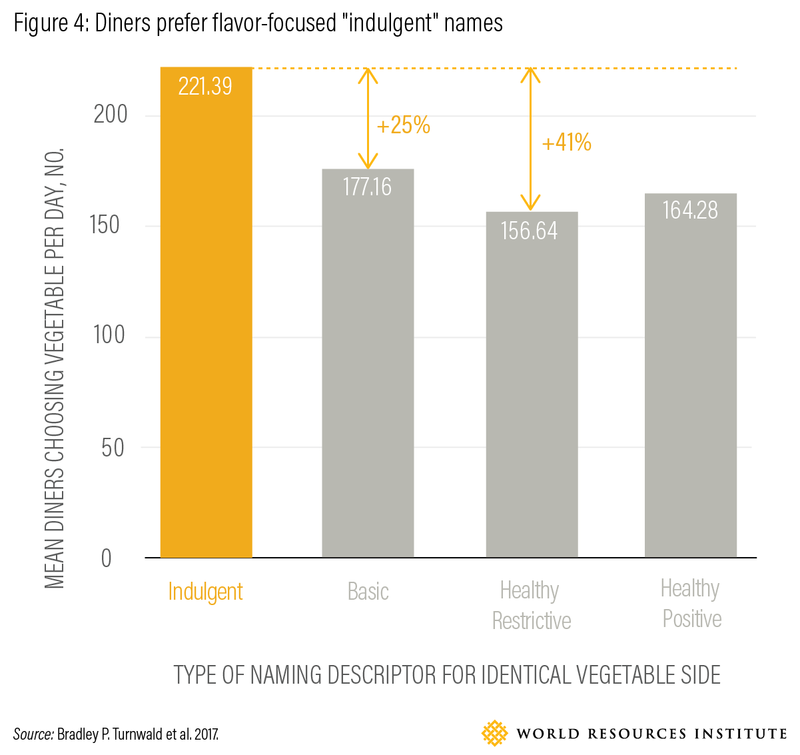 Flavor-focused labels (called "indulgent" in the study) such as "Rich Buttery Roasted Sweet Corn" and "Zesty Ginger Turmeric Sweet Potatoes" were chosen by diners 41 percent more often over identically prepared vegetables with "healthy-restrictive" labels and 25 percent more often than those with "basic" labels (Figure 4). An online study conducted by the Better Buying Lab with the Behavioural Insights Team in the UK backs this up. For example, renaming "Chickpea and Potato Curry" to "Mild and Sweet Chickpea and Potato Curry" increased stated ordering by 108 percent. Such increases mean that flavor-packed language could be a strategy that increases the sensory appeal of plant-rich dishes to be as high or higher than meat-centered dishes. "A compelling dish name should emphasize culinary qualities that make that dish delicious and distinctive," says Scott Giambastiani, chef and food service manager at Google. Our research and others' show that a dish's flavor, appearance and mouth-feel can dramatically affect diners' preferences, and plant-rich foods are delicious and distinctive in these areas. Plant-rich foods come in a spectrum of colors, and color has been shown as the single biggest cue people use to set their expectations of what a food will taste like. And emphasizing the variety of color in a dish can result in a significant increase in ordering. This is a powerful way to differentiate plant-rich foods from meat-based alternatives. "Rainbow Salad," for example, creates an expectation of a fresh, flavor-packed and visually vibrant dish. Mouth-feel matters too. Different from flavor, this is about the sensation your mouth has when eating a food. It's to do with texture and feeling. In online research the Better Buying Lab conducted with the Behavioural Insights Team, renaming "Gnocchi with mushroom, fresh spinach and Parmesan sauce" to "Melt in the mouth Gnocchi with mushroom, fresh spinach and creamy Parmesan sauce" generated a 14 percent increase in consumer-stated likelihood of ordering the dish. Using tempting language like "melt in the mouth" is associated with high-fat food and, for many consumers, is positively received and can therefore overcome prejudices that plant-rich food is boring, bland and not tasty. Some terms chefs might incorporate into dish names include "creamy," "warming," "crunchy," "smooth" and "sticky." The above advice represents the Better Buying Lab's initial findings on which language can suppress and enhance consumers' appetites for plant-rich foods. However, because consumer habits are nuanced – depending on location, demographics and even time of day – more research is still needed. While the Lab is involved in moving this effort forward, such a high potential area needs more attention from more parties. The Lab recently convened academics and industry practitioners, who identified the range of research questions that should be explored. We welcome food companies and other groups keen to explore this area further to sign up for a webinar March 6, where we will discuss the research underpinning our conclusions. We also hope you will sign up for Better Buying Lab updates and consider joining our work. For more information, visit the Better Buying Lab website or contact Jillian Holzer, Communications Manager for the WRI Food Program. The Better Buying Lab brings together the brightest and best minds from consumer research, behavioral science, and marketing strategy along with companies in the food industry to research, test, and scale strategies that help consumers buy more sustainable products. The Better Buying Lab is grateful to the KR Foundation and Wellcome Trust for supporting this research, and to our partners who are helping advance this work.